Home » Pastor to Pastor » Is Scripture Enough for Biblical Counseling? Is Scripture Enough for Biblical Counseling? In counseling, when people share their most serious and secret problems, counselors need to have something to say. We need guidance about how to respond to such information. Trenyan is a great example. I sat in my office listening to her that day as she shared some very painful information with me. She told me of deep heartache in her life and how she came to begin cutting her legs with a small knife she bought at a craft store. After Trenyan shared her story with me, she quit talking. It was my turn to speak. That moment when the counselor must respond to the pain that has been revealed by a broken person is one of the most sacred occasions in all of life. Another human being has just revealed something intimate, profound, and difficult about her life, and now she is waiting for a response. Those moments make me powerfully aware of my responsibility as a counselor to offer wisdom and care. Those moments are very telling because what we say in them reveals where our trust is. Whatever we say demonstrates a reliance on some source of authority. There is no flight from this reality. In those times, like the one I experienced with Trenyan, the words that fill the silence show what counseling resources you believe to be the most informative, helpful, and trustworthy. The “wisdom” that comes out of your mouth demonstrates where your trust is—whether it is the “wisdom” of the world, the “wisdom” of secular psychology, your own personal brand of “wisdom,” or the wisdom of God in the Bible. Whenever you speak, you do it out of a commitment to some kind of wisdom. The doctrine of the sufficiency of Scripture is a promise that God himself will give you something from him to say in those sacred moments. It is a great comfort to me to know that I do not have to make up my own “wisdom” and I do not have to rip off the “wisdom” of secular therapy. I can go to Scripture and find something to say to people like Trenyan that will be God’s sufficient word for them. I got to know Trenyan over a period of months in the context of counseling. We met every week and talked about her troubles and what God says about them. As I listened to her situation, I came to understand why Trenyan would cut her legs the way she had been doing. As it turned out, she had been having a great deal of trouble with her parents. Her parents would scream at one another and yell obscenities back and forth. Sometimes these arguments became violent. Trenyan and I had dozens of conversations about all manner of issues. The most important element of our conversations together came to be Psalm 55. Trenyan would tell you that this passage of Scripture was the most important one in giving her hope and changing her situation. Read a portion of David’s cry to God in Psalm 55:4–8, 12–14. Though David wrote this psalm, and though his situation was undoubtedly different from Trenyan’s, he uttered words in response to his pain that Trenyan could have composed word for word. Trenyan and I camped on this idea for a while together. It was so encouraging for her to know that there were words in the Bible that gave expression to her sorrow. Psalm 55 does more than identify with Trenyan’s pain. There is the description of a different and better path forward. Even David expresses pain and a desire to flee, but the crucial difference between Trenyan and David is that the psalmist turns his pain into an occasion to pour his heart out to God. After identifying with David, Trenyan needed to learn from him. Through David, God taught Trenyan how to reach out to him in her moments of pain. Trenyan learned that through the immediacy and dynamism of prayer, it was possible to cast her burden on the Lord. Unfortunately, Trenyan’s parents never heeded any counsel. They continued to fight, and their marriage eventually came to a bitter end. Counseling with Trenyan was a success, though. Years later I presided over her marriage to a wonderful and godly Christian man. Trenyan learned that trials do not require a retreat inward. They can, instead, become an occasion to grow in God’s grace and be a conduit of that grace to others who need it. The source of the changes in Trenyan is none other than God himself. His actions of love and grace, as expressed in his Word and applied to Trenyan, resulted in change. 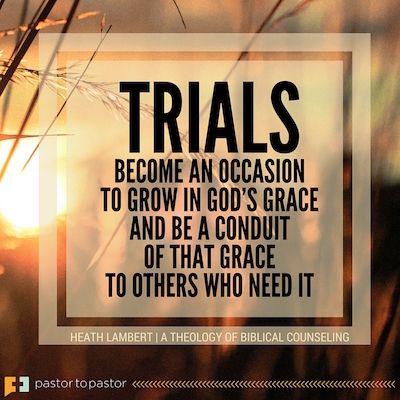 — Heath Lambert, adapted from his new book A Theology of Biblical Counseling: The Doctrinal Foundations of Counseling Ministry. Do you counsel others? A Theology of Biblical Counseling will equip you with the biblical truths and wisdom you need to do your job effectively. 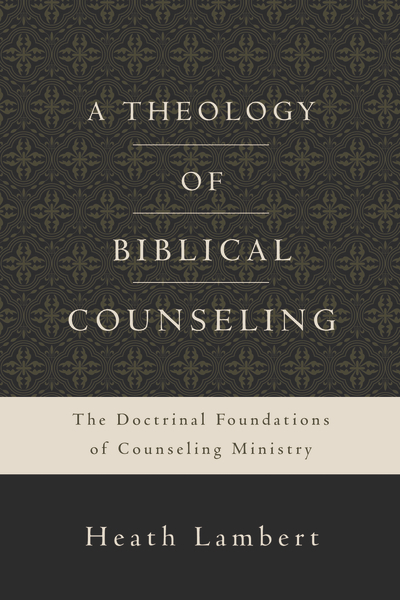 You will understand the core theological convictions that underlie sound counseling. Real-life illustrations will help you prepare for the challenges you will face in the counseling room.